The best way to get customers to your dental practice is to make sure that you’re easy for them to find online. Though targeting keywords like “cavity fillings,” or “wisdom tooth x-rays” can be helpful in helping patients find you, you’ll get the most value out of targeting long tail keywords with your content. Call 888-601-5359 to speak with a strategist about digital marketing plans from WebFX, or keep reading to learn more about how you can select the right long tail keywords for your dental practice. What’s the difference between a regular keyword and a long tail keyword? Regular keywords are words and phrases that you target in order to attract customers to your dental practice, like “dentist Harrisburg PA.” You can think of these keywords as sort of generic versions of long tail keywords – they don’t give a lot of information, and they’re generally broad searches with a lot of potential results. If the keyword doesn’t include the location, they can also return results of practices that are located anywhere in the world. Long tail keywords, however, have the potential to drive the most valuable traffic to your website because they are detailed words and phrases that relate directly to you, your services, and even your location. These keywords are longer than regular keywords, and though they may sometimes seem too specific, the more detailed, the better. You can generally expect less traffic from these keywords since fewer people are searching for these ultra-detailed terms. However, the people that are searching for them will most likely convert. How can long tail keywords benefit my dental practice? There are many benefits to using long tail keywords in your content, and it’s definitely worth your time to come up with a unique list for your own practice based on location and your unique offerings. As we mentioned before, long tail keywords won’t get your dental practice more traffic in general, but it will attract more qualified traffic that is highly likely to become a patient. When you use long tail keywords, you are speaking directly to the audience that needs a specific service that not every practice offers. Pages that target long tail keywords are easy to rank for because users that find them will be happy to read on a topic that isn’t typically covered by all dental practices. Since long tail keywords are so detailed, there are typically fewer competitors targeting them. For example, if you target the keyword “dental office,” you’re trying to rank for a keyword that hundreds of other practices are also trying to rank for – and not just in your area, but around the world. When you use long tail keywords, you cut down traffic by targeting users that are in your location, looking for the services you offer. How can I develop my own list of long tail keywords? There are a number of steps that make up the process for finding the perfect long tail keywords for your dental practice. They include brainstorming, keyword research tools, and using Google Keyword Planner. Before you can find the most beneficial long tail keywords for your dental practice, you’ll need to do a brainstorming session to come up with basic keywords. You should make a list of services you offer, and then think of synonyms for those services, or other ways that people may phrase searchers for dental care. This allows you to target users that search your service by a number of different names. For example, if teeth cleaning is one of your services, make sure that “teeth cleaning” is one of your keywords, but also target “dental cleaning.” That way, even users that call the same service by another name will also see your services. You should also come up with keywords related to the blog posts, informational articles, and other content already on your site so that users are attracted to those pages as well. Once you’ve built out an initial list, you can use keyword tools to expand your options and identify keywords you didn’t initially think of. Ubersuggest.io and keywordtool.io are both great tools for finding keywords that are alternatives of ones that you’ve already come up with. The list shows other keywords related to your initial keyword for your practice to target, and can give you insight into the information your potential customers want. Ubersuggest in particular offers you a list that covers terms from all letters of the alphabet. 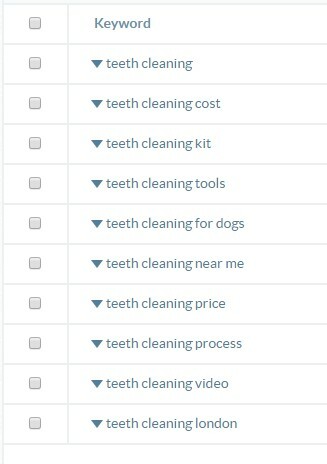 For example, “teeth cleaning” is the main keyword, but you can sort through the website to find terms that are “teeth cleaning” followed by a word starting with a through z.
Google Keyword Planner is a great tool that can help you understand how difficult it will be to rank for any given keyword. This is useful because it can help you decide what keywords are worth targeting, and which ones you will have a harder time ranking for. Click “Get search volume data and trends,” and you’ll see a list of your selected keywords, along with the average monthly searches, and how difficult it is to rank for each one. The difficulty is based on the level of competition there is for any given keyword. If you find that one keyword is much easier to rank for, while also providing a high search volume, you should choose that keyword over one that is extremely difficult to rank for. Ready to improve your digital marketing strategy? WebFX can help. We have years of experience creating results-driven campaigns for our clients, and we can do the same for you. When you’re trying to come up with a list of long tail keywords for your practice, you should think about what makes it unique. Are you the only practice in the area that provides porcelain veneers? Do you provide a new x-ray technology that no other practice has adopted yet? If so, those are the keywords that will attract the most valuable patients to your website and to your practice. It’s also beneficial to include your city or location in your long tail keywords, since those will target the people that live close to your practice, and can likely make you a family provider. This is a great tactic for really narrowing down your target customers in a positive way, since patients in California may be looking for your services, but are unlikely to come to your practice if you’re located in Pennsylvania. Does your dental practice need help targeting long tail keywords? At WebFX, we know important qualified traffic is to your dental practice. And if you’d like some assistance attracting that traffic through long tail keywords, we can help. We have an experienced Internet marketing team that is dedicated to creating unique keyword strategies for each of our clients, and has years of experience helping them attract qualified traffic. We’ll help your practice find the perfect long tail keywords, then create content that will help potential patients convert.